I have a Vortex Viper Pst 4-16×50 scope mounted on a Remington 700 SPS Tactical chambered in .308. I purchased the scope for $900 and the fit and finish of the scope is near perfect. Vortex is possibly one of the best values in mid-high range scopes. The equivalent Leupold would be another $300 and a Nightforce even more than that. More than anything else in the gun world, when it comes to optics you generally get what you pay for. This is where Vortex has really carved out its niche. It has become known for making very good quality scopes with very good glass at a very good price point. The Vortex Viper PST line offers illuminated reticles on all models. What makes this scope so good is the magnification range is about perfect all around. With 4-16 magnification you can shoot from 100 to 1000 yards very well. The Mil scope adjustments are an improvement over the standard MOA adjustments of most American scopes. This allows your adjustments to match the reticle in your optic. If you range a target and need to make a 1 Mil adjustment you put ten clicks onto your optic and are good to go. With a traditional MOA optic with a mil based reticle you need to convert Mils to MOA and then dial the adjustment. Its just an unnecessary step and the reason military scopes now are adjusted in 1/10 mils instead of the traditional 1/4 or 1/2 MOA adjustments. The first focal plane insures that your reticle is accurate at any magnification. With a second focal plane optic the reticle is only ‘correct’ at one setting, usually at the highest magnification. So 1 Mil would equal 1 Mil only at 16x magnification. At 8 magnification it should equal 1/2 Mil. Another step you can avoid with the FFP optic in which the reticle is correct throughout the entire magnification range. Vortex also offers fantastic customer service and one of the best warranties in the business. I’ve seldom needed to take advantage of it but any time I have contacted them the interaction has been fantastic. I can strongly recommend this scope for the serious hunter, long range shooter or tactical shooter. One note, if you are going to install the shims for the zero stop feature, be sure to not scissor the shims as they go in. If you do the zero stop will vary quite a bit. It’s not that big a deal but I have read where people are complaining about this. This entry was posted in Miscellaneous and tagged Vortex Viper FFP, Vortex Viper PST, Vortex Viper PST 4-16x50 on January 23, 2015 by GunGuy. Last year I was on the look out for a new scope for my DMR rifle. I purchased the Vortex PST 2.5x 32 mm scope after talking to some friends about their experiences. After using the scope for over as a year I find that the Vortex Viper PST 2.5 – 10x32mm is an excellent scope for the money. The optic is very clear and bright and the finish is a nice matte black. The turrets have the right amount of resistance to them and have a nice positive feel so you know that you have moved the turret. The turrets are easy to read and setting the zero stop with the included brass shims is a breeze. In my extensive testing the scopes adjustments seem to be accurate. I have used the scope out to 650 yards and consistently hit targets I was aiming at. I have used the shim stop system and it works well. The illumination works great at dawn, dusk, and night. The illumination is not bright enough to been seen during the day but that’s not really an issue since you can see the reticle without any issues. I really like the reticle on this scope as it is very clear and easy to use. Using the mil system to calculate range is easy at most magnification settings except the lower ones. This is my first, first focal plane scope and so far I am liking it. The eye relief is very generous in the horizontal plane at all magnification settings. The ring that changes the scope’s magnification is pretty stiff and will not be moved on accident. I am able to change magnification with out problems as it feels smooth when the ring is turned though I will be adding a Vortex SV-1 Throw Lever to aid in rapidly transitioning through the magnification settings. I only have one major con and that is that the reticle is pretty small at 2.5x magnification and can be hard to see on darker backgrounds. That is a con of a first focal plane scope though. That being said I don’t think I would want the reticle made thicker to make it easier to see at 2.5x magnification because it’s just the right size at 10x magnification. Overall I would highly recommend this scope. Especially for a DMR or SPR type rifle. It’s about as close to perfect for that setup as you can get. I have mine mounted on my PWS AR and it’s working great so far. 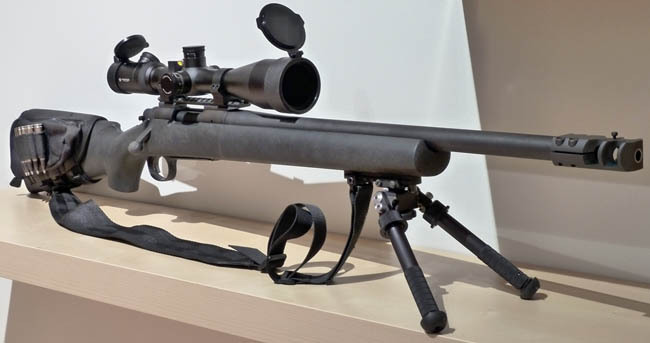 This entry was posted in Firearms, Miscellaneous and tagged DMR Scope, FFP Scope, PWS MK1, SPR Scope, Vortex Review, Vortex Throw Lever, Vortex Viper PST on November 7, 2014 by GunGuy.